With advanced designs and unprecedented affordability, Bigblue offers the most affordable and technologically advanced LED dive lights on the market. 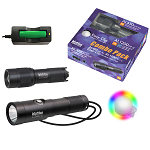 They incorporate the latest technologies producing the most efficient portable illumination. In addition to brilliant design features, Bigblue offers the most ideal lights for underwater illumination, night diving and even video lighting. Whether you are looking for a simple recreational dive light or a full-blown technical underwater illumination system - Bigblue has a light for you! Scuba Center is an authorized Bigblue. These head-mounted lights boast 450 lumens of power. Mounted on an adjustable head-strap which fits most head sizes, and powered by (3) AAA batteries. These head-mounted lights boast 1000 lumens of power. Mounted on an adjustable head-strap which fits most head sizes, and powered by Rechargeable Li-Ion 18650 Battery. AL450WMT: This light is a rugged, reliable, and compact light with a powerful output. The AL450WMT offers 450 lumens, a 40° beam angle, a push-button tail switch for on/off function, and a lanyard. This is a great small light option for any diver. CF450G: The Bigblue CF450 offers a long list of features that makes it the only light you’ll want to carry: Focusable beam angle from 37 degrees to a narrow 7 degrees by twisting the front bezel. Magnetic on/off swivel switch offers one-hand operation while providing reliable and safe switching. Stand-alone 3AAA battery holder (use Alkaline or NiMH batteries only – not included). Durable anti-corrosive aluminum alloy construction. Double o-ring seal. Adjustable lanyard included in all package styles. AL1200NP-II: Narrow beam angle of 10°. The AL1200NP-II offers great features including the push-button on/off switch, battery-level indicator, and rechargeable lithium ion battery. Comes with a blue dry bag! AL1200XWP-II: Wide beam angle of 120°. The AL1200XWP-II offers great features including the push-button on/off switch, battery-level indicator, and rechargeable lithium ion battery and charger. This light also comes with both a red and yellow filter, as well as a mounting clip for easy camera system set-up. Comes with a green dry bag! CF1200P-II: The CF1200P-II is a powerful light giving 1200 lumens and 4 power settings with an SOS function. This light has a push-button on/off function, a lithium ion rechargeable battery and charger, a battery level indicator on the light, and an adjustable beam angle between 7° narrow beam and 37° wide beam. This light is a great, versatile light option for any diver. Comes with a light blue dry bag! CP-450WT-1200N-EZCR: The AL1200NP-II offers great features including the four-level push-button on/off switch, battery-level indicator, and rechargeable 18650 lithium-ion battery. With its narrow 10° beam angle this is the perfect light for general purpose diving. AL1800XWP-TC-II: This light is nicknamed the “Black Molly IV” and is perfectly priced and now equipped with a warm white color in addition to the cool white and red LED. All three colors have the same 120-degree beam and have an illuminated power switch which serves as a battery indicator at the same time. The AL1800XWPTC-II comes standard with built-in red LEDs for enhanced focusing and night video work. The light comes with a one-inch ball for universal video system mounting. The Black Molly IV is powered by a rechargeable 26650 Li-ion battery. The battery is easily removed and replaced with an optional spare battery that can be kept fully charged for convenient extended use. VTL3500P: The VTL3500P offers BOTH a flood beam at 120° AND a narrow beam at 10°! The light is controlled by a reliable push-button on/off switching system with 4 levels of brightness for the wide beam, 1 level for the narrow beam, and 1 for the red beam. The light also has a built-in battery indicator, it comes with a sturdy Goodman-style glove for hands-free operation, a standard 1" ball joint for easy camera set-up, a removable yellow filter, a Lithium ion battery and charger. Our battery design makes it easy to remove and replace the battery in-between dives with an optional spare battery. A compact version of the popular Bigblue mounting tray: Single handle has a 1” ball at the top of the arm. The tray comes with an anodized aluminum Go Pro ® adapter, screws and a wrench. Adapters and clips sold separately. Bigblue aluminum base and handles with a comfortable neoprene grip for each arm. Each handle has a 1” ball at the top of the arm. The tray comes with an anodized aluminum Go Pro ® adapter, screws and a wrench. Use with Sea and Sea Standard Adapter (or similar). 1" ball - 2.5" overall length. The Bigblue accessories series employs the latest designs that cater to different photographic and video systems. By utilizing the best possible materials on the market, such as T6061 aluminum -- this popular thread adapter is a quality choice. Bigger, brighter, stronger for 2016, this light is our version of a multi-color marker light. Low light output so it is not distracting but bright enough to be seen by other divers. This light easily clips on to mask straps, belts, straps and any many other locations. Colors include red, green, blue, purple, and yellow in single unit. All colors have a flash mode as well. Powered by 2 standard CR2032 coin cell batteries, the Easy Clip can last up to 24 hours. A Lanyard is included to keep it attached to your equipment. 100M depth tested.